I’m still playing with the new Swirly Bird stamp set. I love it! It’s versatile, so I can use it for many different types of cards. I’m in need of a birthday card for a friend this month, so this was just perfect. It’s bright and cheerful and looks like a party on a card. Stampin’ Bonus Days are still going strong. With every $50 spent, you’ll earn $5 to spend on products next month. 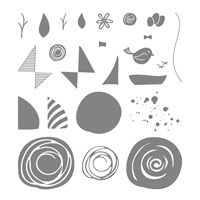 That combined with my free shipping rebate mean a significant deal on stampin’ supplies for you! PS - I updated the family blog today if you wanted to see photos from this past week. The link is pinned on the sidebar. Are you Ready for Holiday Items Yet?? ?